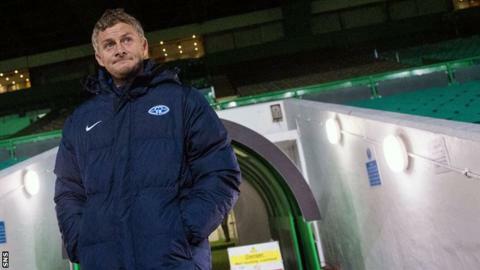 Ole Gunnar Solskjaer has no fears that his Molde side could be "turned over" by Celtic in Europa League Group A. The Norwegians beat Celtic in the former Manchester United striker's first game back at the club. "Of course 3-1 is a great result, but the boys can perform better," said the Molde head coach. "But we will play against a team that is hitting form. Ronny Deila's team, since the last game, is scoring goals, won three games and they need to win." While Molde are the surprise group leaders, Celtic sit at the bottom and are looking for their first victory. "Maybe their supporters expected Celtic to turn us over," said Solskjaer. "That's not how football works these days. "We arrive here not expecting to be turned over away from home, but we know it's going to be a tough game." Solksjaer, who joined Molde as boss for a second time on the eve of the previous encounter, says his players can savour the atmosphere in Glasgow. "We don't have that pressure of having to win the game, but if we do, we are through, so that's a great carrot for us," he said. "It's going to be a tough game, of course, but the boys have put themselves in a fantastic position. "They've been great in the first three matches and I'm sure they are looking forward to this one." Solskjaer says Molde's impressive win on home soil over Celtic should not be underestimated. "Maybe the Celtic supporters were more surprised than Ronny and his players just how good a team these boys are," he said. "They've earned the right to play in this group because they were one penalty away from being in the Champions League more or less. "They missed two against Dinamo Zagreb, a team that's beaten Arsenal. They drew against them, so the boys have a decent standard." Molde have followed up their win over Celtic with two domestic victories. "Obviously Celtic had the possession," added Solskjaer. "They dominated the game, but we hit them on the break really well. "The standard of counter attacks and the goals we scored were top class and we know that, from earlier performances, we can hit any team on the break."